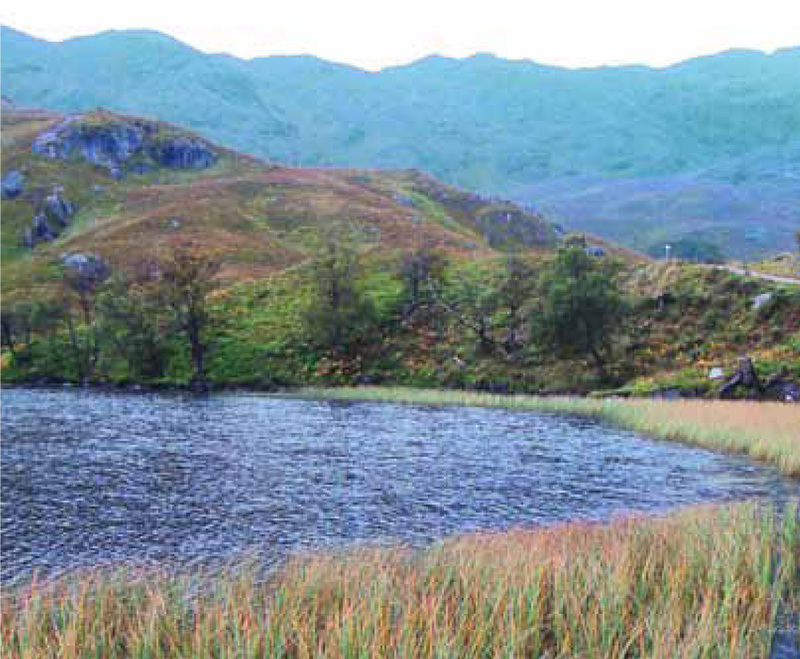 If you have every fished a Scottish loch, observing very little activity can elicit a lack of confidence. Couple this with the vastness of water and you would be forgiven to ask if there is any point in trying? 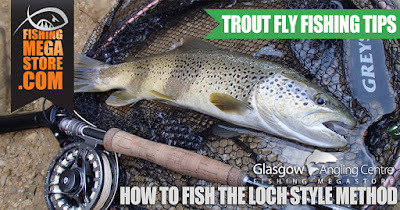 However, the keys to successful loch fishing are to be confident in your set-up, keep moving, and be prepared to fish very close to the margins. 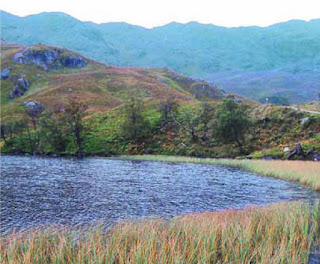 The 'loch-style' method is by far the most effective tactic when fishing lochs. 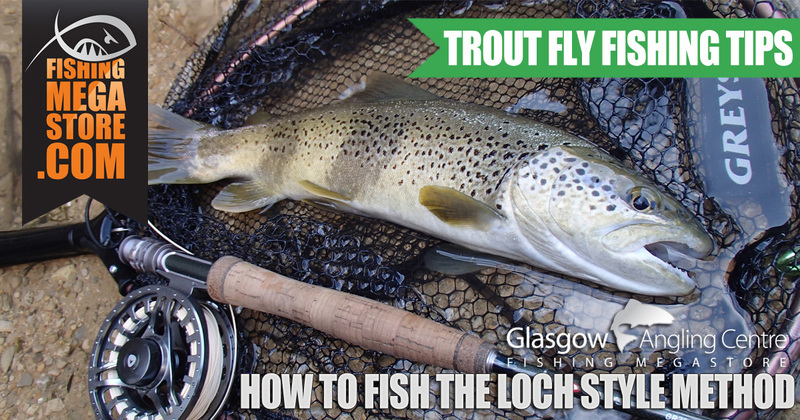 This traditional method allows you to cover vast areas of water whether trout are rising or not, especially if the loch is very exposed to wind. 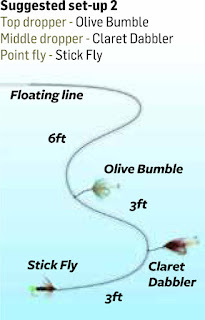 Generally speaking, the technique involves a slightly longer fly rod than usual (anything up to 11 foot), which is not required for distance, but more so for controlling your flies on a short line to work/dibble the top dropper fly through the wave tops. From the bank, a compromise rod of 9ft 6in still has sufficient length to work trout flies through wave tops, yet gives you some authority for tackling a headwind. The idea is to fish up to three flies (known as a ‘team’) together, hopefully attracting trout to one of the patterns yet ends up taking one of the other flies instead. A classic case is using a bright, conspicuous pattern to attract fish, and then for them to turn away and seize a more natural looking fly that trails behind. The three flies are presented on a trout leader 12 feet in length with the first (top) dropper positioned six feet from the fly line, the middle dropper is three feet from this, leaving a further three feet to the point fly. 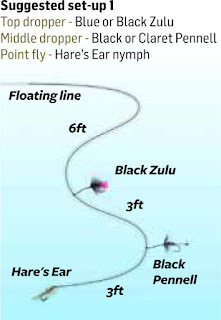 Palmered, bushy flies such as a a Black Zulu, Bibio or Kate McLaren are predominantly used for top droppers as these not only take their fair share of trout but the disturbance they make often draws fish to them and consequently the other flies. 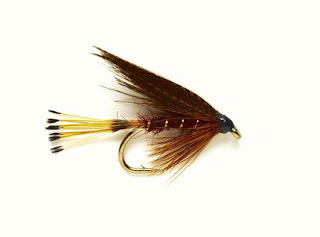 Slender flies with sparse hackles and wings, such as a Mallard and Claret, seem best on the middle dropper. Their aerodynamic profile is also less likely to tangle leaders. 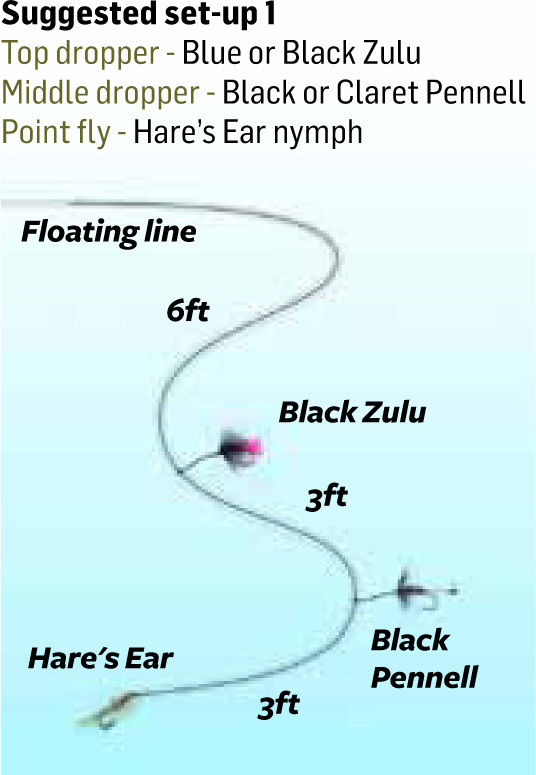 Something a little more grubby looking, like a Hare's Ear, should be considered for a point fly. 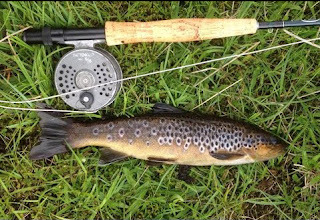 That said, when trout are showing a preference for the top/middle dropper, indicating they are ‘looking up’ – a lightweight point fly will fish close to the surface too. A floating line covers most situations, especially during late May and early June when chances are trout will readily move to intercept a fly. Remember too that many lochs have shallow, shelving banks where sunlight easily penetrates to produce weed growth and consequently support aquatic invertebrates, which is where trout will congregate to feed. So, focus your efforts over these margins before trying deeper water. Brown trout are quite territorial by nature and remain close to their chosen domain. So rooting yourself to one spot and waiting for fish to simply swim by is detrimental. Instead, travel light and cover as much water as possible. An effective game plan is to cast, retrieve, then take a step along the bank before repeating the cycle and so on. This way you are literally exploring new water with every cast. The only time to loiter for two or three casts from the same position is when you have either moved or missed a fish. As for retrieval rate, this will depend on the trout’s mood. On some days, fish prefer a fast-moving fly, on others, flies worked slowly are a better bet. As a rule, start with a medium paced pulling retrieve and take it from there. Keep a well-elevated rod tip, as browns take with lightning fast speed. Too taut a line from rod tip to fly results in fish "bouncing" off during their strike. A little slack line allows them to turn down without feeling any resistance, almost hooking themselves in the process. 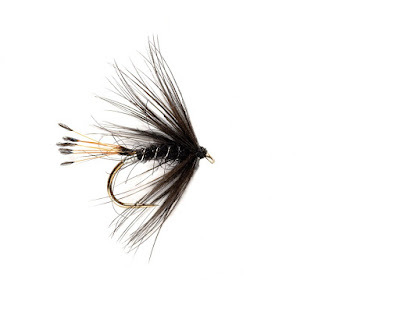 When it comes to loch wet fly patterns, every colour imaginable has been used, making for a bewildering choice. However, use the following as a guide and you won't go far wrong. 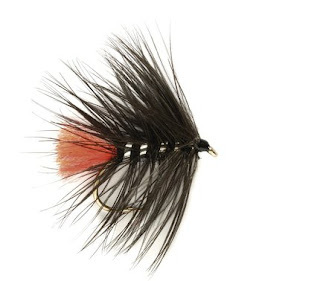 Early season, flies should be dark: black, dark claret and browns work best. Through late spring and summer, various olive shades, red and orange patterns come into their own. However, where terrestrials occur, black can also be deadly. For late season, revert back to the dark patterns but add a hint of flash. When armed with the right mindset, the right fly set-up, and a willingness to keep moving and exploring, fishing medium to large Scottish lochs should no longer feel intimidating.